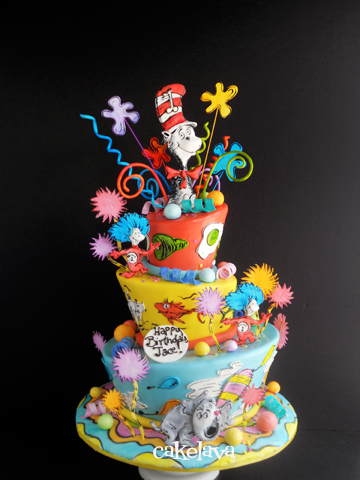 cakelava: Happy Birthday, Dr. Seuss! ... Here's a Cake for You! Theodor Seuss Geisel, who is better known as Dr. Seuss would have turned 109 on Saturday. Dr. Seuss is one of the most influential authors of our time and his wonderful world of whimsy is celebrated daily across the world. We honor Dr. Seuss' influence by remembering our collection of books - some of our earliest exposure to literature was Dr. Seuss' Cat In the Hat, Green Eggs and Ham, One Fish, Two Fish, Red Fish, Blue Fish and so forth. We've seen the movies, both live action and animated, and the Dr. Seuss theme has been popular for designers across many disciplines. It has especially resonated within the cake community. Some of our favorite cakes made at cakelava have had a Seussian theme. This fun and colorful Dr. Seuss themed cake was made by Rick and featured Cat and the Hat, Thing 1 and Thing 2, and Horton Hears a Who characters as selected by our client. The cake was made in March 2012 and was never shared on our blog that month because I didn't have an opportunity. A quick look through our 2012 archive and you'll note we don't have a single post in March. We traveled for part of the month, then immediately had a photo shoot for 'Extreme Cakeovers" book, then were occupied with cakes for the rest of the month. I had meant to share it after March because we were proud of the cake and the client absolutely adored it, but the cake got filed away. Then, over the weekend Rick and I were talking about Dr. Seuss' birthday and he brought up the cake. It was one of our favorite cakes that Rick made in 2012. Each of the characters were made and hand painted. It was a super cute topsy, turvy design with each tier done in a different color scheme. I really like the truffulas and playful pieces sticking out of the cake and theme lends itself to many different approaches for the design. On a previous Seuss themed cake, our client wanted the cake with a sculpted Cat and the Hat on top, which Rick made out of cake. Each version has its own special qualities and we love them both! Happy Birthday to the late Dr. Seuss! We are grateful to this visionary for creating a magnificent world where anything is possible, filled with positive messages that makes us feel great, and reminds us what it is like to be a kid again! Aloha Sasha and Rick!! This cake turned out really, really nice. I love all the realistic details Rick add to all his cakes. I can't wait to get your new book, so looking forward to it. Amazing - I can't believe the details! I think this is the best Dr. Seuss cake that I have ever seen. Wow! That is an amazing compliment. Thank you Juanita!